1. Capable of wearing down or rubbing away by friction; able to erode. 2. Able to make weary through constant irritation; to wear down spiritually. 1. 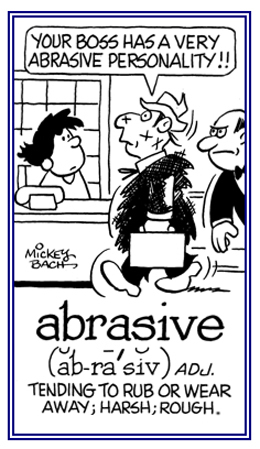 Having an abrasive property, effect, or quality; abrading. 2. A tool or machine used for wearing down or smoothing or polishing. 3. A substance that abrades or wears down. 1. To wear down or to rub away by friction or scraping. 2. To erode or to damage something by rubbing its surface too hard. 3. To make weary through constant irritation; wear down spiritually. 4. Etymology: from Latin abradere, "to scrape off"; from ab-, "off" + radere, "to scrape". A reference to being harsh and rough in one's manner: Jane's abrasively critical comments about her brother's political views resulted in an unpleasant argument. A substance that is used for rubbing something to make it smooth, shiny, or clean: The abrasiveness of the cleaning material made the sculpture bright and glistening. An instrument used for abrasion. The removal of superficial layers of the skin with a rapidly revolving abrasive tool. Related "scrape, scratch; shave; razor" word families: xyro-; xys-.